Four days before Pearl Harbor, in December 1941, someone leaked American contingency war plans to the Chicago Tribune. The small splash the story made was overwhelmed by the shock waves caused by the Japanese attack on the Pacific fleet anchored in Hawaii--but the ripples never subsided, growing quietly but steadily across the Cold War, Vietnam, the fall of Communism, and into the present. Ripped from today's headlines, Lloyd C. Gardner's latest book takes a deep dive into the previously unexamined history of national security leakers. 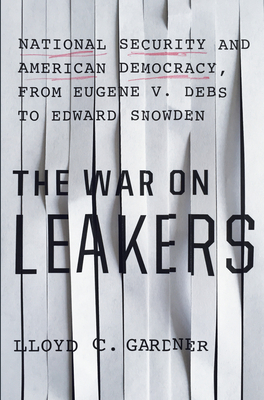 The War on Leakers joins the growing debate over surveillance and the national security state, bringing to bear the unique perspective of one our most respected diplomatic historians. Gardner examines how national security leaks have been grappled with over nearly five decades, what the relationship of "leaking" has been to the exercise of American power during and after the Cold War, and the implications of all this for how we should think about the role of leakers and democracy. Gardner's eye-opening new history asks us to consider why America has invested so much of its resources, technology, and credibility in a system that all but cries out for loyal Americans to leak its secrets. Lloyd C. Gardner is professor emeritus of history at Rutgers University. He is the author or editor of more than a dozen books, including The Long Road to Baghdad, Three Kings, The Road to Tahrir Square, and Killing Machine, and a co-editor (with Marilyn B. Young) of The New American Empire and Iraq and the Lessons of Vietnam, all published by The New Press. He lives in Newtown, Pennsylvania.